Our electric underfloor heating mats are a popular choice because they are easy to install compared to hot water systems. Most DIY enthusiasts find they are able to fit them with the help of a registered electrician. Underfloor heating is easiest to install before laying down your floor, making it ideal for new builds, retrofits and bathroom renovations. The first step is to check what type of floor structure you have before planning to install underfloor heating. All solid floors (such as concrete, screed or asphalt) need to be insulated with backer boards before installing underfloor heating. The heating mats are then placed directly onto the boards with adhesive. A waterproof membrane may also be needed to act as a vapour barrier and prevent damp. 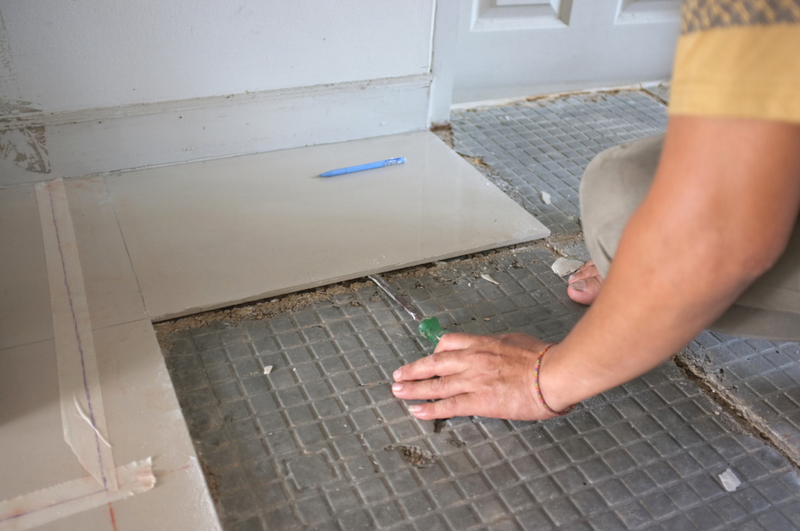 A floating floor does not need to be nailed or glued to the sub-floor below. This is the best type of floor for underfloor heating because it makes heating mats easy to fit. Once your heating system is installed in the space provided, you can finish with laminate, vinyl, ceramic tiles, wood, chipboard, or any floor covering you desire. Once you’ve insulated or removed existing floors, you’re ready to start laying and starting to install the underfloor heating. Note that installation kits will vary between brands, so always read instructions carefully. Roll out the underfloor heating mat onto the floor, starting from the edge of the room. Use a pair of scissors to cut the length of the mat to size. Make sure you do not cut the electrical element, only the fibreglass mesh. Once you’ve cut your piece, repeat this action until all places you want to be heated are covered. Cover only the areas of the floor you will walk on, avoiding the space under the bath tub and shower. Once you’re happy with the coverage, peel off the backing on the heating mats to stick them down. Next install the sensor, following the instructions provided in your kit. If you’ve got a solid floor, you may want to cut an indent into the insulation board, so the probe sits nice and flush. Employ a qualified electrician to make the final connection of the mats to your mains electricity. After testing your mats with a multi-meter to ensure they are working, you are ready to start laying down the levelling compound and flexible floor adhesive. The good news is that most underfloor heating mats can be used with every type of floor covering. Our Devi Mat Comfort range is versatile for everything from concrete to wood. Underfloor heating mats are ideal for cold surfaces, as the heat will rise and can warm your feet in a matter of minutes. 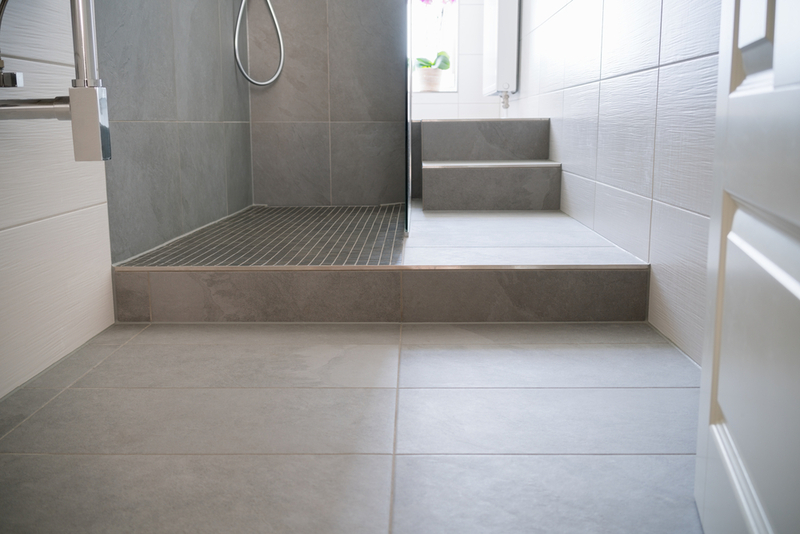 The Phoenix Underfloor Heating Kit has been specifically designed for tiled areas, making it the perfect choice for your bathroom. Evenly distributed heat is the best way to warm up wood floors, because they can distort in extreme temperatures. This is why electric underfloor heating installation is ideal. It will warm your room in a gentle and controlled way. For precise heating control, fit your underfloor heating system with the Devi Reg 535 Thermostat. It gives you seven-day programming to keep temperatures just right. Linoleum is widely used because it’s both cheap and compatible with underfloor heating systems. But remember that linoleum floors can dry out if they get too hot, so an advanced heating control (like the Devi Reg Smart Thermostat) is recommended. You should also choose an underfloor heating kit with a sensor that has a maximum limit function. With underfloor heating, carpet may not warm up as quickly due to the insulating effect it has. For best performance, choose a carpet with a 1.5 tog rating or below. Using a levelling compound before tile adhesive will create better heat distribution and protect your cables. Glue guns are safe for adhering your mats down if the sticky backing isn’t enough for the task. Cables on underfloor heating mats must not be crossed. Doing so will cause overheating in a localised area, causing damage to the system. Leaving gaps in your levelling compound or adhesive will cause air pockets, leading to uneven heat and cable damage. 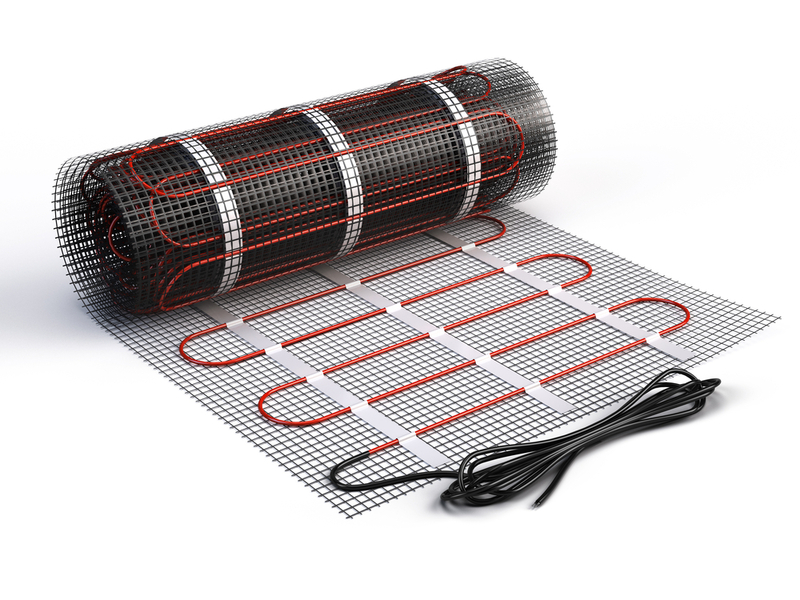 All heating elements should be fully enclosed by the floor covering in order to prevent problems of overheating. Want to find out more about underfloor heating? Well, we have a handy guide on the costs of underfloor heating here.